Since its inception in 1986, DRIVE! magazine is America’s #1 automotive event source, covering everything from nostalgia racing and classic car restoration to high-tech street rodding, right on through ’70s muscle cars, today’s sport trucks, dressed out SUVs and more. Auto enthusiasts with a passion for all things automotive depend on DRIVE! for how-to articles, show listing, pictures of cars and events, plus performance parts and services information. Grassroots rodders and racers, 98% of whom say they participate in events each year, turn to DRIVE! Published 12X per year, DRIVE! magazine is a free publication distributed at retail shops and events throughout California, Nevada, Arizona and the Northwest. 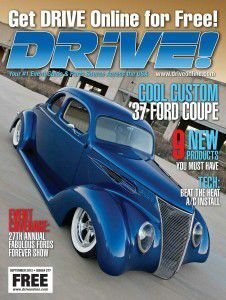 Each issue of DRIVE! magazine is jam-packed with show listings, in-depth technical stories, new parts showcases, new tool showcases and info about the latest performance trends. Drive! Magazine’s primary goal has been helping readers have fun with their cars! That may mean cruising to shows, bolting on a super-charger, or putting it through the paces at the track. Our readers are a diversified group, but they’re confident that every month Drive! is there for them with the latest trends, hottest new parts, and the best places to take their cars and have fun! Established as America’s #1 Event source (with exhaustive pre and post event feature coverage and the most comprehensive calendar listings in the industry), Drive! features hundreds of showâ€“nâ€“go listings each and every month and at times, such as event season, you’ll find in excess of 2,000 event listings, making Drive! an invaluable resource for any event goer. Grassroots rodders and racers, 98% of which say they participate in events each year, turn to Drive! Magazine for feature car coverage, insightful tech how-to’s, celebrity forums, and the most complete listings of events in the country. Drive! Magazine’s powerful â€œBuyer’s Guidesâ€ are carefully crafted to enlighten and help the automotive enthusiast make educated purchases. When it’s time to buy or sell their pet car or project, our readers turn to the proven performance of Drive! Magazines classified listings. Drive! Magazine covers all the action, from nostalgia racing, classic car restoration, to hi-tech street rodding, right on through the 70’s era muscle cars, and today’s sport trucks and dressed-out SUV’s.